Given the large percentage of districts that chose to keep language in teachers union contracts regarding prohibiting subjects of bargaining per Public Act 103, school leaders may not actually be fully aware of the latitude they have to improve the quality of the teaching in their schools. This survey suggests that further review is needed to determine whether districts are following their contracts and continuing to use seniority-based personnel and teacher evaluation policies — arguably some of the most important decisions school administrators can make to boost student performance — that appear to conflict with Public Acts 100, 101, 102 and 103 of 2011. 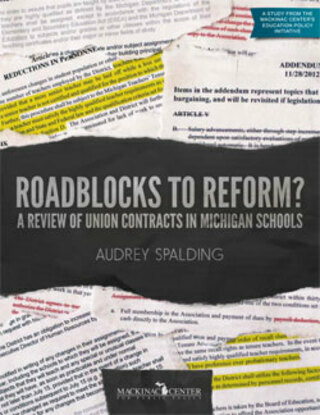 Administrators may be able to make decisions unilaterally regarding prohibited subjects of bargaining even if their current contract — agreed to after the 2011 reforms took effect — says otherwise. School leaders facing a confusing contract with contradictory provisions may need to consult an attorney if they are unable to make effective decisions based on the contract language. This is unfortunate, because it places additional and unnecessary costs on schools. Finally, by prohibiting these subjects of bargaining, the state has given administrators the freedom to establish more effective policies. School administrators do not have to adopt policies that are simply carbon copies of previous contract language. School districts can implement policies intended to truly reward and encourage high-performing teachers. Instead of rewarding teachers based on years on the job, as was the prevailing policy prior to the 2011 reforms, administrators could creatively use placement and transfer priority as a method to encouraging outstanding performance.